I can’t complain. I do have things pretty good here in the library. Oh, yes, I get cross sometimes when they won’t let me out to chase after those birds, and what fun is there to be had now that all the mice in the neighbourhood know not to come into the lighthouse. But otherwise, I can’t complain. Don't I look nice in this picture? Love the scarf! I was mighty worried when Sarah, my young servant girl, found out that her family was moving to Germany (where on Earth that is!) and I couldn’t come with them. Good heavens! I’ve heard about cats being abandoned on the streets or shoved out of a car into a field. Places with no kibble, no bowls always full of fresh tasty water, and no one to clean out the litter box. Shudder. 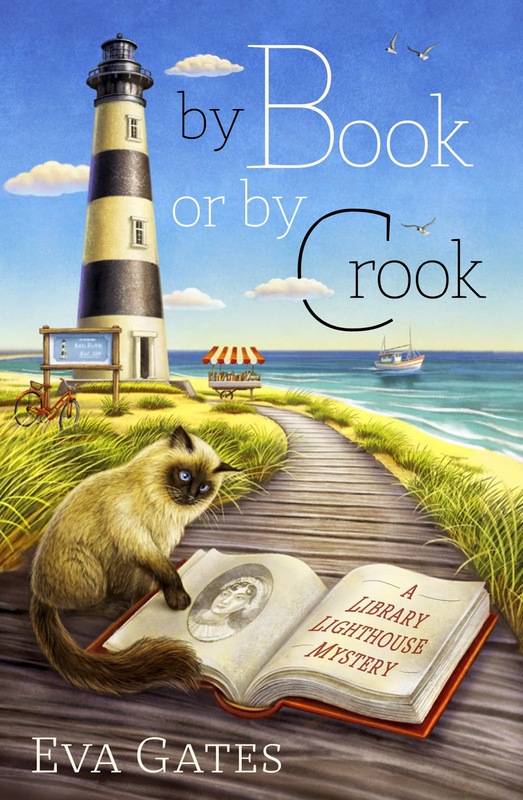 Thankfully Sarah’s mom thought I’d enjoy living at the Bodie Island Lighthouse Library, and they took me in. Not only that, but I was given the official position of Library Cat. Most important , you know. Things here got even better when Lucy Richardson arrived to work here. Her first, and most important, job was as my new servant. So far she’s doing an adequate job. I suggested that my dishes and.. ahem.. litter box be taken upstairs to her apartment, not kept in the staff restroom which is really rather demeaning. I mean do you eat in the bathroom? Once that was settled, and I’d realized that her lovely day bed is far more comfortable than that sleeping mat they bought at the pet store for me, we were fine. Now, I only have to convince Lucy that I know what’s best for her and all will be perfect. She seems not to be getting my hints about unsuitable people for her to be friends with. Two nice men are currently paying court to her. I like them both, but one is so obviously so much more suited to her than the other. She seems to be blind, not only to his charms but to my increasingly obvious hints. It might be time for me to resort to desperate measures. 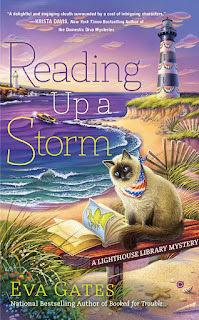 I loved the first two books in this series and can hardly wait to read "Reading up a Storm". 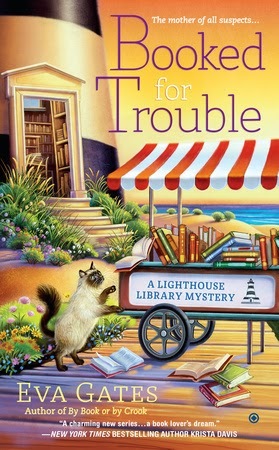 I love the idea of a library in a lighthouse. Every library should have a cat! Thanks, Charles, for your input. I have loved reading about you and the lighthouse library. I enjoyed meeting Charles the library cat while reading the lighthouse library series. Yes, my cats prefer to sleep on my bed or the couches and other impossible places rather than the lovely beds and mats I have bought for them! Charles has just the right amount of cattitude! Love the series.